French Knot founder and Peach Holiday 2018 Featured Entrepreneur, Lindsay Mason. After years of working within various design roles focused on knitwear, Lindsay Mason felt she had finally developed the industry knowledge, production processes know-how and confidence in her skillset that she needed to create something of her own. Despite all odds and with a focus on social responsibility, the French Knot brand was born and she has been rewriting the rules for fashion production ever since. Lindsay’s love of knitwear and passion to support female artisans came together to create hand-knit products celebrating time-honored craftsmanship and a commitment to responsible sourcing. Her collection of beautiful, unique hats and accessories.are lovingly crafted by over one thousand women artisans in Nepal; providing them with a meaningful source of income. Here at Peach, we offer personal and professional development as part of our Stylist Opportunity; with a mission to support women entrepreneurship and empower women to create a career that works for their lifestyle. As someone who has done just that, we couldn’t be more thrilled to announce Lindsay Mason as our featured entrepreneur for the Holiday 2018 Winter’s Tale collection. We sat down with this fearless female entrepreneur and knitwear enthusiast to find out what inspired her to start her own business, and how she’s been able to build the French Knot brand and simultaneously become a global crusader. Knitwear is such a specific niche within the fashion industry. What made you want to create a business within this category rather than a typical ready-to-wear clothing brand? I found what was inspiring to me! When I was studying at Syracuse, my favorite class was knit design and I decided to do a minor in Textile Design. I loved working on the hand-knitting machines so much that I had a hard time leaving class! Picking out yarn colors and knitting swatches was something that I wanted to do all day long. When I graduated and began working in the industry, one of my jobs was a design assistant at Free People. They couldn’t decide which department to put me in and they ended up putting me in both accessories and sweaters. A few years later, I landed a job as the accessories designer for knit accessories. Once I saw how much my original designs were selling, I realized I had the passion and chutzpah to do it on my own! French Knot Founder Lindsay Mason with some of the women artisans in Nepal who make her products by hand. Why was it important for you to incorporate female artisans and a socially responsible corporate mission? There is something special about working with hand-knits and knowing that a person’s time and talent went into crafting a beautiful item. These days, I think people are too far removed from how things are made. I wanted there to be a deeper connection between the customer and both the people producing them and places where they are being produced. To me, sourcing responsibly is the only option. I wish it wasn’t something that companies even have to market because everybody should be doing it. I wish more people would understand that low prices at places that sell fast fashion come with a different type of cost. What is the biggest sacrifice you made in starting or running your business? Well, at 28, I was laid off from my job as a knitwear designer in Colorado. At that point in my life, single and having just moved back into my parents’ house, the only way things could go was up! My dad built me a small office in his barn, where I worked most nights until 11pm. It didn’t feel like I was sacrificing anything -because I was determined and excited! There was a solid year of no paycheck and living off my savings, but money certainly doesn’t buy happiness because I remember being elated at the idea of creating a business. One thing that’s different from a typical job is that it’s not 9-5. Sometimes it requires working on the weekends; I often work after hours. I’m so passionate about French Knot that I really can’t imagine doing anything else. We were excited to hear that French Knot recently got picked up by Anthropologie! Do you consider this your biggest break through so far, or is there something else that stands out in your mind? Lindsay Mason in the French Knot Design Studio. Our very first season, Sundance Catalog and Athleta came to our tradeshow booth and bought from us. That was big deal! I vividly remember when Sundance brought a team of people into our booth at our very first show…I couldn’t talk and hid in the corner of the convention hall behind a sign. Luckily, I had a friend with me who took over. Oh, the memories! I’ve come a long way! What resources would you recommend to someone starting a creative business? I always tell people to work in the industry before starting a business. If you are able to design unique and original pieces that sell, that’s the first step! But gaining industry knowledge and understanding everybody’s roles in the company is also necessary. 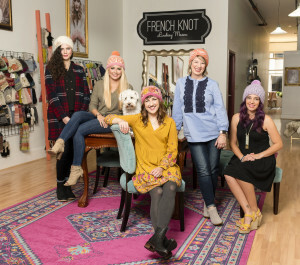 The team behind the French Knot brand. If you were given $100 million, would you run your business any differently? How so? I honestly already feel like I won the lottery with what I have now! But if I had to come up with an answer…I would love to hire a CEO first, that way I can concentrate on design and development with the big team of amazing designers I would hire. I also have a dream of buying our own office that is a warehouse and design space in one! But most importantly, I would share it with our partners in Nepal so they are also able to expand with us. Shop French Knot knitwear here. Shop Peach’s latest collection here.